Stand-up is not a gig in which you say, “It isn’t rocket science.” It’s harder than rocket science. And like rocket science probably was for ages, comedy was not woman’s work when Joan was coming up in the 1960s. A woman could know she was funny, but to make a living out of it? At that time, there was Phyllis Diller, Moms Mabley, Totie Fields, and that was about it. Right on, because if you want to become a rocket scientist, there’s an established way to do this: college, graduate school, and a system of professional mentors. It’s not easy, but there is a pretty clear path. If you want to be a comedian, especially a female comedian, there’s not an established path, and there were and still are very few mentors. That’s called being fearless, in case you needed another reason to worship Joan. Then she picked up the check, by the way. She always picked up the check. One time, I was committed to getting that check first, only to find that she’d had her assistant call ahead that afternoon when she learned where I was taking her, and pre-picked up the check. I didn’t even know you could do that. I’ve always found Kathy Griffin hilarious, but who knew she was such a damn good writer? Joan Rivers spent her entire career jumping over hurdles. 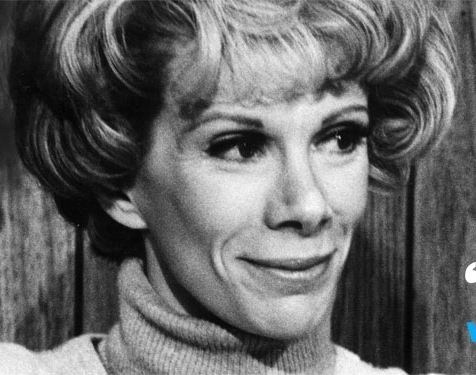 She entered a system so entrenched in tradition that she basically threw a monkey wrench into the way comedic women were seen and enjoyed worldwide on every kind of medium. It is easy to admire that Joan was still working at 81. What was unparalleled was that at 81, she was the first woman in history to have three shows on at one time (a reality show, a cable fashion show and a Web talk show). She wasn’t just working at 81; she approached every performance like a shotgun. Simon Doonan at Slate wrote a nice tribute last year on the occasion of Rivers’s 80th birthday, and it was republished yesterday upon word of her death. The headline explains his take on Rivers: “Joan Rivers Taught Us to be Bitchy to Celebrities but Nice to People.” Not a bad epitaph. ← Steady. Aim. Fire. Everyone’s SAFE! Thanks for this H’ann. It’s a sad turn of events. Folks are usually surprised to find that I admire Joan Rivers. I don’t much care for stand up comedy but I always thought of her as a feminist icon (no matter what she said about that label). She fought to do what she was good at (comedy, producing, etc.) and was successful, despite monumental hurdles. And to think that she was going strong at 81 is really wonderful. I especially like the “why would I care about that?” topic question, and think it should be recommended more widely as a starting point for the kind of awkward inquiry launched by the “how do you deal…?” opener. It doesn’t categorically deny that there *might* be a reason to care about “that,” but it re-sets the default, I think in a helpful way. Decent respect for the opinion of world-kind probably works best as an opt-in, rather than an opt-out, phenomenon. I don’t know much from stand-up comedy of any sort, really, although I have retained the “class clown” thing as a (usually somewhat) recessive trait in my overall toolkit. She was tough as nails. Loved that about her.